The result is better dinners and a happier mama! And a happier and healthier family too! I am super organized and always hated the idea of thinking up what to make for dinner, let alone actually cooking it. I had no idea those two things could be related, but when I happened to stumble upon menu boards on Pinterest everything I thought I knew about making dinner changed! I had frequently collected recipes in magazines, ads and even on Pinterest. But I had a hard time getting to the point of making those recipes. I decided to make a menu board as a potential way to help me organize my dinner ideas and maybe actually might lead to making some new meals. What I discovered was that not only was I trying new recipes, but I also became a better and more thrifty grocery shopper. And (a BIG and) I was actually getting excited about dinner time! At the end of the work day, I would look forward to making dinner! Talk about a complete 180! My menu board is a compilation of different ideas I found on Pinterest. After browsing through various menu boards and thinking about how my mind works, I decided on this. I wanted to be able to see my options all at once and to be able to swap things easily (because let’s face it, plans change and tastes change). To make this, I used a side of a cardboard diaper box, covered it in scrapbook paper and then added sticker letters for the title and even added a spot for a shopping list. I used velcro for the meal ideas so I could easily move them around. I also added a small cardboard box, covered in paper as well. 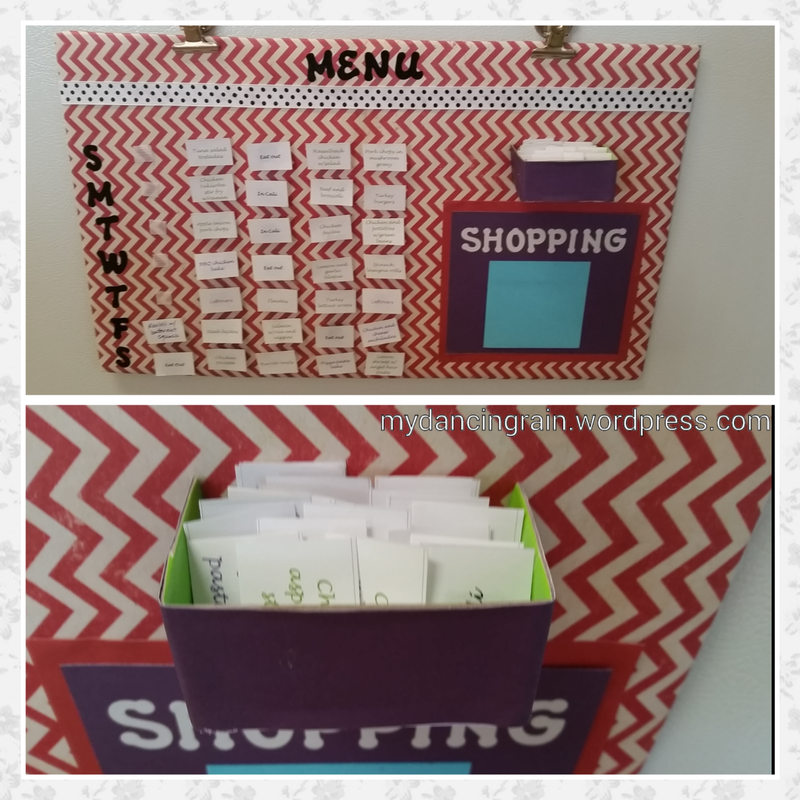 This would hold my extra meal idea tags. To create the meal idea tags, I went through all my meal ideas I’ve collected over time and narrowed the choices down to what I considered doable, based on time involved (most 30-45 minutes or less), complexity (because I am a novice) and ingredients (using staples that I usually have or buy). Then I typed out each one, printed the sheet and cut them apart using my paper cutter. I color-coded my tags to distinguish the not-so-healthy meals so that I could make sure not to have too many in the same week or month. As I said, the result has been more than I could have imagined! This is a huge help in my household, to avoid the daily struggle of deciding what to make and to help make sure I have what I need when I need it. I highly recommend it. Soon I will share some of my favorite dishes! So creative and cute! Monthly meal planning like mom used to do. 😊. Great idea.